NAIROBI – HUAWEI Technologies has invested KSh5,3 million ($52 700) at a Kenya private university to enhance training and equip learners with skills to address national and global challenges through technology. 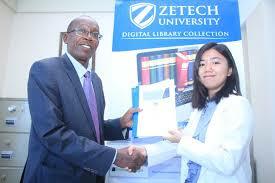 The provision of ultra-modern training equipment furthers the Chinese firm’s partnership with Zetech University. The deal will see Huawei provide training equipment including modern routers, switch and management devices to the institution’s Faculty of Information and Communications Technology (ICT) and Engineering. laboratory room for the Huawei ICT Academy. required to address the changing needs of the IT Industry. “Through this endorsement, we are set to achieve great things together.” Munene said. Su Shuqi, Huawei Training and Certification Manager, Enterprise Business Department, said establishing a knowledge transfer hub was an effort to reward and appreciate the achievements the university had attained and provide the institution with the right resources and training facilities to continue as a leading Huawei Academy. Information Network Academy (HAINA) in May 2018. The partnership has seen the university receive the Best Huawei ICT Training Academy 2018 award during the Huawei ICT Competition 2018-2019 Southern Africa Academy held last November. First launched in 2017, the HAINA programme aims to transform universities into institutions that produce skilled workers to drive continued transformation of the economy through technology.